This new post ignites a new thread. Subject: the Science of Neutrinos. Something I usually call Neutrinology. I am sure you will enjoy it, since I will keep it elementary (even if I discuss some more advanced topics at some moments). Personally, I believe that the neutrinos are the coolest particles in the Standard Model, and their applications in Science (Physics and related areas) or even Technology in the future ( I will share my thoughts on this issue in a forthcoming post) will be even greater than those we have at current time. The existence of the phantasmagoric neutrinos ( light, electrically neutral and feebly -very weakly- interacting fermions) was first proposed by W. Pauli in 1930 to save the principle of energy conservation in the theory of nuclear beta decay. The idea was promptly adopted by the physics community but the detection of that particle remained elusive: how could we detect a particle that is electrically neutral and that interact very,very weakly with normal matter? In 1933, E. Fermi takes the neutrino hypothesis, gives the neutrino its name (meaning “little neutron”, since it was realized than neutrinos were not Chadwick’s neutrons) and builds his theory of beta decay and weak interactions. With respect to its mass, Pauli initially expected the mass of the neutrino to be small, but necessarily zero. Pauli believed (originally) that the neutrino should not be much more massive than the electron itself. In 1934, F. Perrin showed that its mass had to be less than that of the electron. By the other hand, it was firstly proposed to detect neutrinos exploding nuclear bombs! However, it was only in 1956 that C. Cowan and F. Reines (in what today is known as the Reines-Cowan experiment) were able to detect and discover the neutrino (or more precisely, the antineutrino). In 1962, Leon M. Lederman, M. Schwartz, J. Steinberger and Danby et al. showed that more than one type of neutrino species should exist by first detecting interactions of the muon neutrino. They won the Nobel Prize in 1988. 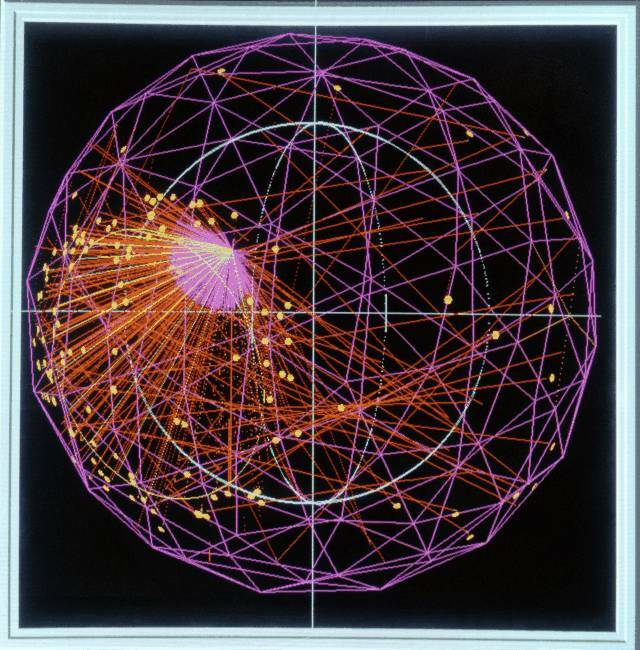 When we discovered the third lepton, the tau particle (or tauon), in 1975 at the Stanford Linear Accelerator Center, it too was expected to have an associated neutrino particle. The first evidence for this 3rd neutrino “flavor” came from the observation of missing energy and momentum in tau decays. These decays were analogue to the beta decay behaviour leading to the discovery of the neutrino particle. In 1989, the study of the Z boson lifetime allows us to show with great experimental confidence that only 3 light neutrino species (or flavors) do exist. In 2000, the first detection of tau neutrino ( in addition to ) interactions was announced by the DONUT collaboration at Fermilab, making it the latest particle of the Standard Model to have been discovered until the recent Higgs particle discovery (circa 2012, about one year ago). 1st. Neutrinos do have a mass. If they were massless, they could not oscillate. Then, the old debate of massless vs. massive neutrinos was finally ended. 2nd. The solar neutrino problem is solved. Some solar neutrinos scape to the detection in Super-Kamiokande and SNO, since they could not detect all the neutrino species. It also solved the old issue of “solar neutrinos”. The flux of (detected) solar neutrinos was lesser than expected (generally speaking by a factor 2). The neutrino oscillation hypothesis solved it since it was imply the fact that some neutrinos have been “transformed” into a type we can not detect. 3rd. New physics does exist. There is new physics at some energy scale beyond the electroweak scale (the electroweak symmetry breaking and typical energy scale is about 100GeV). The SM is not complete. The SM does (indeed) “predict” that the neutrinos are massless. Or, at least, it can be made simpler if you make neutrinos to be massless neutrinos described by Weyl spinors. It shows that, after the discovery of neutrino oscillations, it is not the case. Neutrinos are massive particles. 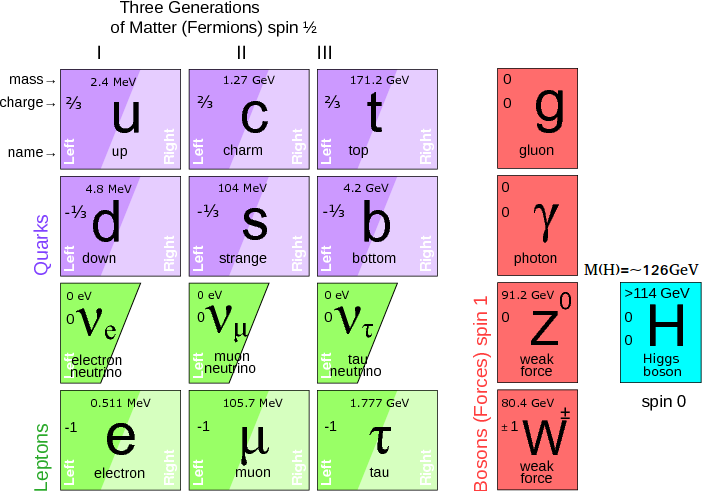 However, they could be Dirac spinors (as all the known spinors in the Standard Model, SM) or they could also be Majorana particles, neutral fermions described by “Majorana” spinors and that makes them to be their own antiparticles! Dirac particles are different to their antiparticles. Majorana particles ARE the same that their own antiparticles. In the period 2001-2005, neutrino oscillations (NO)/neutrino mixing phenomena(NEMIX) were observed for the first time at a reactor experiment (this type of experiment are usually referred as short baseline experiment in the neutrino community) called KamLAND. They give a good estimate (by the first time) of the difference in the squares of the neutrino masses. In May 2010, it was reported that physicists from CERN and the Italian National Institute for Nuclear Physics, in Gran Sasso National Laboratory, had observed for the first time a transformation between neutrino flavors during an accelerator experiment (also called neutrino beam experiment, a class of neutrino experiment belonging to “long range” or “long” baseline experiments with neutrino particles). It was a new solid evidence that at least one neutrino species or flavor does have mass. In 2012, the Daya Bay Reactor experiment in China, and later RENO in South Korea measured the so called mixing angle, the last neutrino mixing angle remained to be measured from the neutrino mass matrix. It showed to be larger than expected and it was consistent with earlier, but less significant results by the experiments T2K (another neutrino beam experiment), MINOS (other neutrino beam experiment) and Double Chooz (a reactor neutrino experiment). A) Normal Hierarchy (NH): . This spectrum follows the same pattern in the observed charged leptons, i.e., . The electron is about 0.511MeV, muon is about 106 MeV and the tau particle is 1777MeV. B) Inverted Hierarchy (IH): . This spectrum follows a pattern similar to the electron shells in atoms. Every “new” shell is closer in energy (“mass”) to the previous “level”. C) Quasidegenerated (or degenerated) hierarchy/spectrum (QD): . per neutrino, then, there would be so much mass in the Universe that it would collapse. It does not (apparently) happen. 2) Cosmological data, such as the cosmic microwave background radiation, the galaxy surveys, or the technique of the Lyman-alpha forest indicate that the sum of the neutrino masses should be less than 0.3 eV (if we don’t include sterile neutrinos, new neutrino species uncharged under the SM gauge group, that could increase that upper bound a little bit). 3) Some early measurements coming from lensing data of a galaxy cluster were analyzed in 2009. 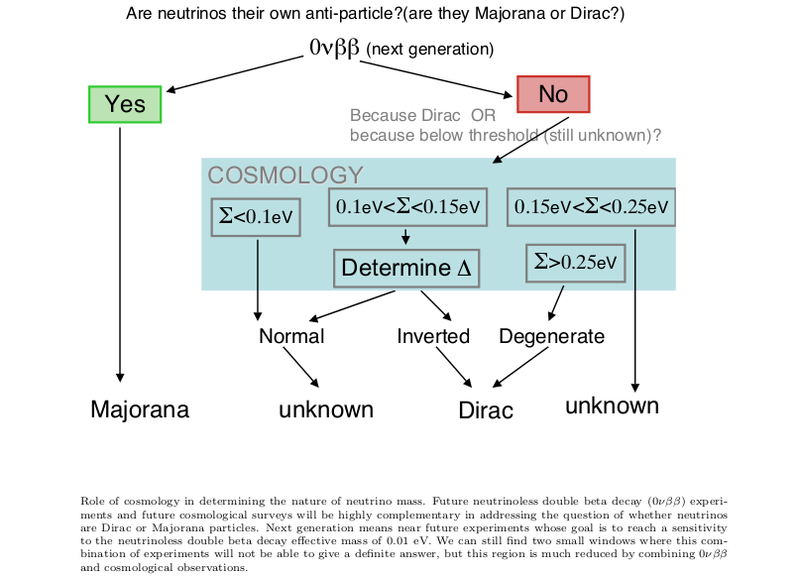 They suggest that the neutrino mass upper bound is about 1.5eV. This result is compatible with all the above results. 1) Nuclear beta decay (KATRIN, MARE,…). 2) Neutrinoless double beta decay (e.g., GERDA; CUORE, Cuoricino, NEMO3,…). If the neutrino is a Majorana particle, a new kind of beta decay becomes possible: the double beta decay without neutrinos (i.e., two electrons emitted and no neutrino after this kind of decay). 1) Baryogenesis from leptogenesis. Neutrinos can allow us to understand how could the Universe end in such an state that it contains (essentially) baryons and no antibaryons (i.e., the apparent matter-antimatter asymmetry of the Universe can be “explained”, with some unsolved problems we have not completely understood, if massive neutrinos are present). 2) Asymmetric mass generation mechanisms or the seesaw. 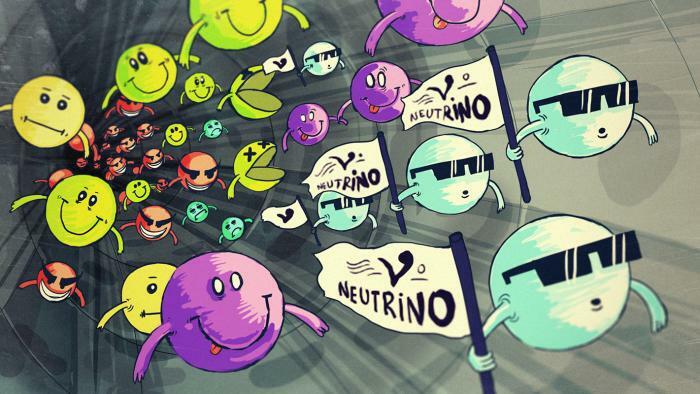 Neutrinos allow us to build an asymmetric mass mechanism known as “seesaw” that makes “some neutrino species/states” very light and other states become “superheavy”. This mechanism is unique and, from some non-subjective viewpoint, “simple”. After nearly a century, the question of the neutrino mass and its origin is still an open question and a hot topic in high energy physics, particle physics, astrophysics, cosmology and theoretical physics in general. If we want to understand the fermion masses, a detailed determination of the neutrino mass is necessary. 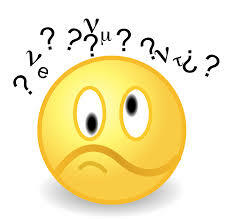 The question why the neutrino masses are much smaller than their charged partners could be important! The little hierarchy problem is the problem of why the neutrino mass scale is smaller than the other fermionic masses and the electroweak scale. Moreover, neutrinos are a powerful probe of new physics at scales larger than the electroweak scale. Why? It is simple. (Massive) Neutrinos only interact under weak interactions and gravity! At least from the SM perspective, neutrinos are uncharged under electromagnetism or the color group, so they can only interact via intermediate weak bosons AND gravity (via the undiscovered gravitons!). If neutrino are massive particles, as they show to be with the neutrino oscillation phenomena, the superposition postulates of quantum theory state that neutrinos, particles with identical quantum numbers, could oscillate in flavor space since they are electrically neutral particles. If the absolute difference of masses among them is small, then these oscillations or neutrino (flavor) mixing could have important phenomenological consequences in Astrophysics or Cosmology. Furthermore, neutrinos are basic ingredients of these two fields (Astrophysics and Cosmology). There may be a hot dark matter component (HDM) in the Universe: simulations of structure formation fit the observations only when some significant quantity of HDM is included. If so, neutrinos would be there, at least by weight, and they would be one of the most important ingredients in the composition of the Universe. Regardless the issue of mass and neutrino oscillations/mixing, astrophysical interests in the neutrino interactions and their properties arise from the fact that it is produced in high temperature/high density environment, such as collapsing stars and/or supernovae or related physical processes. 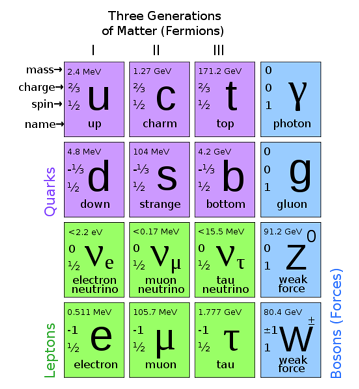 Neutrino physics dominates the physics of those astrophysical objects. Indeed, the neutrino interactions with matter is so weak, that it passes generally unnoticed and travels freely through any ordinary matter existing in the Universe. Thus, neutrinos can travel millions of light years before they interact (in general) with some piece of matter! Neutrinos are a very efficient carrier of energy drain from optically thick objects and they can serve as very good probes for studying the interior of such objects. Neutrino astronomy is just being born in recent years. IceCube and future neutrino “telescopes” will be able to see the Universe in a range of wavelengths and frequencies we have not ever seen till now. Electromagnetic radiation becomes “opaque” at some very high energies that neutrinos are likely been able to explore! Isn’t it wonderful? Neutrinos are high energy “telescopes”! By the other hand, the solar neutrino flux is, together with heliosysmology and the field of geoneutrinos (neutrinos coming from the inner shells of Earth), some of the known probes of solar core and the Earth core. A similar statement applies to objects like type-II supernovae. Indeed, the most interesting questions around supernovae and the explosion dynamics itself with the shock revival (and the synthesis of the heaviest elements by the so-called r-processes) could be positively affected by changes in the observed neutrino fluxes (via some processes called resonant conversion, and active-sterile conversions). Finally, ultra high energy neutrinos are likely to be useful probes of diverse distant astrophysical objects. Active Galactic Nuclei (AGN) should be copious emitters of neutrinos, providing detectable point sources and and observable “diffuse” background which is larger in fact that the atmospheric neutrino background in the very high energy range. Relic cosmic neutrinos, their thermal background, known as the cosmic neutrino background, and their detection about 1.9K are one of the most important lacking missing pieces in the Standard Cosmological Model (LCDM). Do you understand why neutrinos are my favorite particles? I will devote this basic thread to them. I will make some advanced topics in the future. I promise. May the Neutrinos be with you! Today we are going to study a relatively new effect ( new experimentally speaking, because it was first detected when I was an undergraduate student, in 2000) but it is not so new from the theoretical aside (theoretically, it was predicted in 1962). This effect is closely related to the Cherenkov effect. It is named Askaryan effect or Askaryan radiation, see below after a brief recapitulation of the Cherenkov effect last post we are going to do in the next lines. 1) The simplest solution is that superluminal quanta just do not exist, the vacuum speed of light being the definitive upper bound. 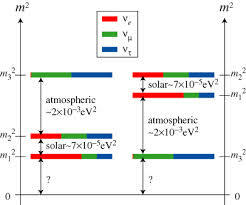 2) The second solution is that the interaction of superluminal radiation with matter is very small, the quotient of tachyonic and electric fine-structure constants being . Therefore superluminal quanta and their substratum are hard to detect. A related and very interesting question could be asked now related to the Cherenkov radiation we have studied here. What about neutral particles? Is there some analogue of Cherenkov radiation valid for chargeless or neutral particles? Because neutrinos are electrically neutral, conventional Cherenkov radiation of superluminal neutrinos does not arise or it is otherwise weakened. However neutrinos do carry electroweak charge and may emit certain Cherenkov-like radiation via weak interactions when traveling at superluminal speeds. The Askaryan effect/radiation is this Cherenkov-like effect for neutrinos, and we are going to enlighten your knowledge of this effect with this entry. We are being bombarded by cosmic rays, and even more, we are being bombarded by neutrinos. Indeed, we expect that ultra-high energy (UHE) neutrinos or extreme ultra-high energy (EHE) neutrinos will hit us as too. When neutrinos interact wiht matter, they create some shower, specifically in dense media. Thus, we expect that the electrons and positrons which travel faster than the speed of light in these media or even in the air and they should emit (coherent) Cherenkov-like radiation. Let me quote what wikipedia say about him: Gurgen Askaryan (December 14, 1928-1997) was a prominent Soviet (armenian) physicist, famous for his discovery of the self-focusing of light, pioneering studies of light-matter interactions, and the discovery and investigation of the interaction of high-energy particles with condensed matter. He published more than 200 papers about different topics in high-energy physics. 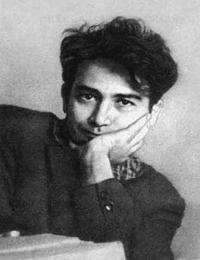 Other interesting ideas by Askaryan: the bubble chamber (he discovered the idea independently to Glaser, but he did not published it so he did not win the Nobel Prize), laser self-focussing (one of the main contributions of Askaryan to non-linear optics was the self-focusing of light), and the acoustic UHECR detection proposal. Askaryan was the first to note that the outer few metres of the Moon’s surface, known as the regolith, would be a sufficiently transparent medium for detecting microwaves from the charge excess in particle showers. The radio transparency of the regolith has since been confirmed by the Apollo missions. What is the Askaryan effect? The Askaryan effect is the phenomenon whereby a particle traveling faster than the phase velocity of light in a dense dielectric medium (such as salt, ice or the lunar regolith) produces a shower of secondary charged particles which contain a charge anisotropy and thus emits a cone of coherent radiation in the radio or microwave part of the electromagnetic spectrum. It is similar, or more precisely it is based on the Cherenkov effect. High energy processes such as Compton, Bhabha and Moller scattering along with positron annihilation rapidly lead to about a 20%-30% negative charge asymmetry in the electron-photon part of a cascade. For instance, they can be initiated by UHE (higher than, e.g.,100 PeV) neutrinos. 1962, Askaryan first hypothesized this effect and suggested that it should lead to strong coherent radio and microwave Cherenkov emission for showers propagating within the dielectric. 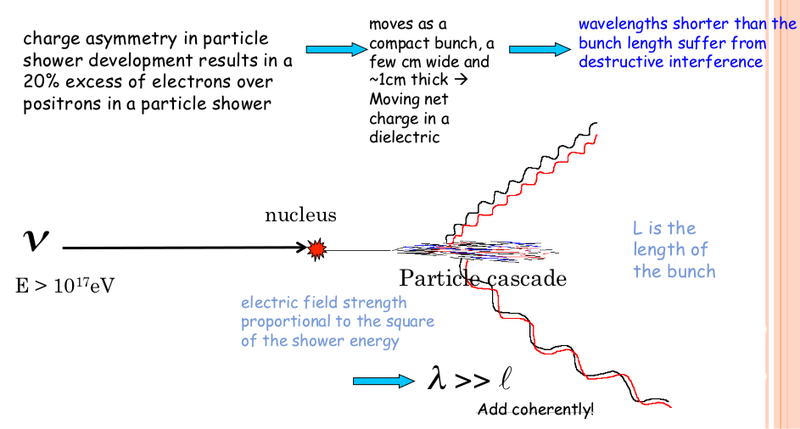 Since the dimensions of the clump of charged particles are small compared to the wavelength of the radio waves, the shower radiates coherent radio Cherenkov radiation whose power is proportional to the square of the net charge in the shower. The net charge in the shower is proportional to the primary energy so the radiated power scales quadratically with the shower energy, . A) The optical case, with . Then, we expect random phases and . B) The microwave case, with . In this situation, we expect coherent radiation/waves with . We can exploit this effect in large natural volumes transparent to radio (dry): pure ice, salt formations, lunar regolith,…The peak of this coherent radiation for sand is produced at a frequency around , while the peak for ice is obtained around . 1st. They provide high densities and then it means a higher probability for neutrino interaction. 2nd. They have a high refractive index. Therefore, the Cerenkov emission becomes important. 3rd. Salt and ice are radio transparent, and of course, they can be supplied in large volumes available throughout the world. 1) Low attenuation: clear signals from large detection volumes. 2) We can observe distant and inclined events. 3) It has a high duty cycle: good statistics in less time. 4) I has a relative low cost: large areas covered. 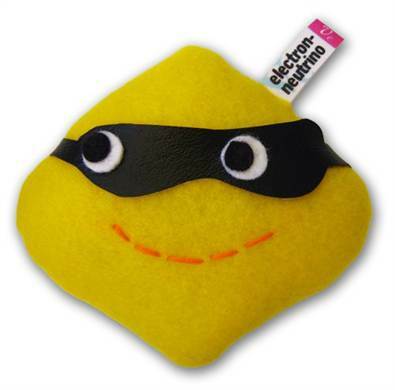 5) It is available for neutrinos and/or any other chargeless/neutral particle! Problems with this Askaryan effect detection are, though: radio interference, correlation with shower parameters (still unclear), and that it is limited only to particles with very large energies, about . Askaryan effect = coherent Cerenkov radiation from a charge excess induced by (likely) neutral/chargeless particles like (specially highly energetic) neutrinos passing through a dense medium. Why the Askaryan effect matters? It matters since it allows for the detection of UHE neutrinos, and it is “universal” for chargeless/neutral particles like neutrinos, just in the same way that the Cherenkov effect is universal for charged particles. And tracking UHE neutrinos is important because they point out towards its source, and it is suspected they can help us to solve the riddle of the origin and composition of cosmic rays, the acceleration mechanism of cosmic radiation, the nuclear interactions of astrophysical objects, and tracking the highest energy emissions of the Universe we can observe at current time. Is it real? Has it been detected? Yes, after 38 years, it has been detected. This effect was firstly demonstrated in sand (2000), rock salt (2004) and ice (2006), all done in a laboratory at SLAC and later it has been checked in several independent experiments around the world. Indeed, I remember to have heard about this effect during my darker years as undergraduate student. Fortunately or not, I forgot about it till now. In spite of the beauty of it! Moreover, it has extra applications to neutrino detection using the Moon as target: GLUE (detectors are Goldstone RTs), NuMoon (Westerbork array; LOFAR), or RESUN (EVLA), or the LUNASKA project. 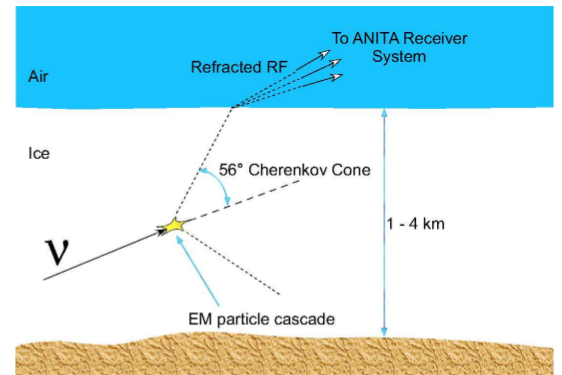 Using ice as target, there has been other experiments checking the reality of this effect: FORTE (satellite observing Greenland ice sheet), RICE (co-deployed on AMANDA strings, viewing Antarctic ice), and the celebrated ANITA (balloon-borne over Antarctica, viewing Antarctic ice) experiment. Furthermore, even some experiments have used the Moon (an it is likely some others will be built in the near future) as a neutrino detector using the Askaryan radiation (the analogue for neutral particles of the Cherenkov effect, don’t forget the spot!). Askaryan effect and the mysterious cosmic rays. Askaryan radiation is important because is one of the portals of the UHE neutrino observation coming from cosmic rays. The mysteries of cosmic rays continue today. We have detected indeed extremely energetic cosmic rays beyond the scale. Their origin is yet unsolved. We hope that tracking neutrinos we will discover the sources of those rays and their nature/composition. We don’t understand or know any mechanism being able to accelerate particles up to those incredible particles. At current time, IceCube has not detected UHE neutrinos, and it is a serious issue for curren theories and models. It is a challenge if we don’t observe enough UHE neutrinos as the Standard Model would predict. Would it mean that cosmic rays are exclusively composed by heavy nuclei or protons? Are we making a bad modelling of the spectrum of the sources and the nuclear models of stars as it happened before the neutrino oscillations at SuperKamiokande and Kamikande were detected -e.g.:SN1987A? Is there some kind of new Physics living at those scales and avoiding the GZK limit we would naively expect from our current theories? QUESTION: Is the time dilation real or is it an artifact of our current theories? 1st. They are created in upper atmosphere at altitudes of about 9000 m, when cosmic rays hit the Earth and they are a common secondary product in the showers created by those mysterious yet cosmic rays. 3rd. Typical speed is 0.998c or very close to the speed of light. A) t= half-life of muon with respect to Earth. B) t’=half-life of muon of the moving muon (in his rest frame S’ in motion with respect to Earth). C) According to SR, the time dilation means that , since the S’ frame is moving with respect to the ground, so its ticks are “longer” than those on Earth. If the gamma factor is bigger, the distance d’ grows and so, we can detect muons on the ground, as we do observe indeed! Remark: In the traveling muon’s reference frame, it is at rest and the Earth is rushing up to meet it at 0.998c. The distance between it and the Earth thus is shorter than 9000m by length contraction. With respect to the muon, this distance is therefore 9000m/15 = 600m. Suppose muons decay into other particles with half-life of about 0.000001sec. Cosmic ray muons have speed now about v = 0.99995 c.
Conclusion: a lot of muons reach the earth’s surface. And we can detect them! For instance, with the detectors on colliders, the cosmic rays detectors, and some other simpler tools.